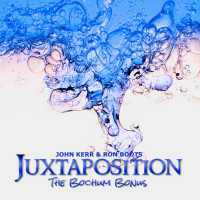 JUXTAPOSITION, THE BOCHUM BONUS is a supplement to our album JUXTAPOSITION. Musical creations which were intended for the first CD but didn't make it simply because of the limited capacity (79 minutes of music) of the medium. However, this doesn't mean that this album is a 'second choice' album. No, not at all! We are just as proud of the music on it as we are of the music on the first album. We had so much material that we decided to produce this second album instead of discarding it all. And here's the result!